She is like a lynx stretching next to me- supple, taut, and smooth. After calm deliberate movements she sits poised in preparation for the hunt- her big push outward. I, on the other hand, feel a tad chilly and also tired. I am a little early for my second ever TRX class and I mentally prepare for my torture by glancing at my cell phone and pretending it isn’t going to happen. If I was an animal what would I be- a domesticated potbellied pig? Deep down my heart is a wild cat but, right now, my body is not so lithe or calculating. I’ll just do my best. Fourteen hours earlier I am lying down next to my daughter. It is dark and warm and I hear her breathing shift into sleep. The warm calm peace of the moment pulls me in. Sleep lures me. Maybe I will just stay in tonight. Once a month a growing group of “Mommy Friends” from the neighborhood go out and have a few drinks. Several of the people going I have never really had the pleasure of talking to without children chiming in or causing us to keep one eye focused away from each other. I go. I pull my tired body out of the warm envelope and splash cold water on my face. Even after almost 3 years of motherhood (and many more opportunities to get out on my own than I had in the first year) I still feel this sudden shock as I step out of the door onto the street at night alone. “Oh yeah- there is this whole other life and world that exists.” I feel liberated and weightless. I show up late, laugh, commiserate, drink a little too much and stay a little too long. Walking home, it is dark and extremely cold but I feel ignited. Pleased by the irreverent humor and the growing comradery of my friends. The street lights are shimmering and I am too- a sparkling combination of the crisp air on my face and the alcohol in my body. Yes, when I go home I will take off my clothes and slip naked into bed with my sleeping husband. A seduction is the plan. Things go swimmingly. My tired but waking husband welcomes my suggestions…. After TRX class I chat with The Lynx. “It is okay to stop and breathe” she says “but then you have to get back up and keep going. When I can, I always do a little bit extra.” I agree. I am trying to do “a little bit extra” more often and for more things. I feel a little high. I came to class tired but I have an exercise endorphin thing going. I am feeling really, really good. The fact is that nothing I did in the last 24 hours was done to perfection or even to completion; however, in all things, I did “a little bit extra.” I feel stronger today than I did yesterday. 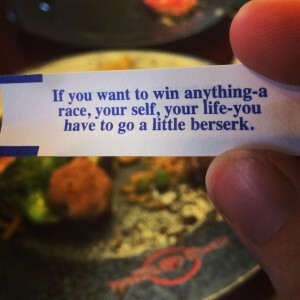 A friend recently received a fortune cookie that said- “If you want to win at anything- a race, yourself, your life- you have to go a little berserk.” I love the unexpected acceptance of a wild frenzy being required for winning. Not just hard work, not just care, not even always doing extra- also a wild, rage or excitement. With every “little bit extra” I do I feel something growing with in me- an inspiration to tap back into my wild cat heart. So while today my new motto is “a little bit extra.” Tomorrow perhaps I will even go a little berserk. This entry was posted in Uncategorized and tagged change, Exercise, Fit Mommy, Fitness, Inspiration, self improvement. Bookmark the permalink. Post a comment or leave a trackback: Trackback URL. Thanks Marissa! I’ve been away too long!! !